One thing that I always look forward to when I go into the hospital to have a baby is peanut butter pie. (I bet you weren't expecting that to be the first sentence in this post, huh?) Yeah, it's true. Ever since I had Ryder at Women and Babies Hospital in Lancaster, I've been in love with pb pie. Literally it was love at first bite. Seriously, if you have to go to the hospital, you may as well enjoy it, right? Actually it's not just the pb pie that's amazing at this hospital...they have the best food there. Crab cakes, delicious salads, man...I could go on and on. But I won't. 'Cause I'm getting hungry just thinking about it. Anyway, after I had Ryder I seriously craved pb pie for the longest time and soon made it for a Thanksgiving get together the year he was born. It was good. I can't remember which recipe I used...one from allrecipes.com, I'm sure. So that was five years ago. And I mentioned recently to my FB followers that I needed to make a dessert for a get together and asked for suggestions. Mitch was craving something with peanut butter. So one of my followers suggested pb pie. I thought, "Sure, why not. I haven't made that in a while." The pie she suggested was this one. I made it, brought it to the get together, and everyone loved it. I really liked the fact that it uses real whipped cream in it and not Cool Whip. I'm trying to feed my family real food and who knows what's in Cool Whip, I mean really. But I didn't really see the need to add sugar to the sufficiently sweet crust. Who needs sugar when you already have crushed-up Oreos? So after I made that pie, I was searching for other pb pie recipes and I found Ree's. I liked that she used powdered sugar in the filling part and there was no added sugar in the crust. But she used Cool Whip:/ So I kinda combined those two recipes to make my own. Let's start with the crust. I threw 25 Oreos into my blender (since I don't have a food processor) Speaking of which, do you have one? Do you use it a lot? I'm trying to decide if I need one. Anyway, back to this deliciousness. After that's all nice and finely chopped up, add 1/4 cup melted butter to it and mix it all up. Press it into a pie dish and bake for about 5-7 minutes. Then I added a little bit more chocolate. Ya can't go wrong with a little extra chocolate, can ya? You could even use chopped up Reese's pb cups. I've used them before and they're an amazing little surprise that you bite into and don't expect to find. But I didn't have any. Dang it. Next up, the filling. Start with a cup o' creamy peanut butter. Mix that all together with some powdered sugar. Then in a separate bowl, you're gonna whip up your whipped cream. Ever do this before? It's fun:) My momma always put her bowl and beaters in the freezer to get 'em chilled. So I did too. Then you just whip away. And it turns all magically fluffy. Then fold in your whipped cream with the rest of the filling. Then spread it all over your cooled crust and sprinkle some chips on top just for the heck of it. Chill for at least an hour, if not more, before serving. Warning: this is super rich and filling! So cut small portions. Unless you have a giant husband, then cut about 1/4 of the pie for his slice. Crush the Oreos until they're fine crumbs. Pour melted butter over the top and stir to combine. Press into pie pan and bake at 350 for 5-7 mintues, or until set. Remove from oven and allow to cool completely. You can add chocolate chips/chopped up pb cups at this time. You won't regret that decision. Beat the peanut butter with the cream cheese until smooth. Add powdered sugar and beat until smooth. Fold in the whipped cream with a spatula. Pour filling into cooled crust, evening out the top with a knife or spatula. Sprinkle chocolate chips on top. Chill for at least an hour before serving. YUM! This looks soooooo good! Oh. My. Goodness. I'm going to have to start running. LOOKS amazing! Going to make this this weekend for my man. You're the best Kat! So every time I read this it makes me think of W&B and having that wonderful expirence of delivering sweet little people into our family! 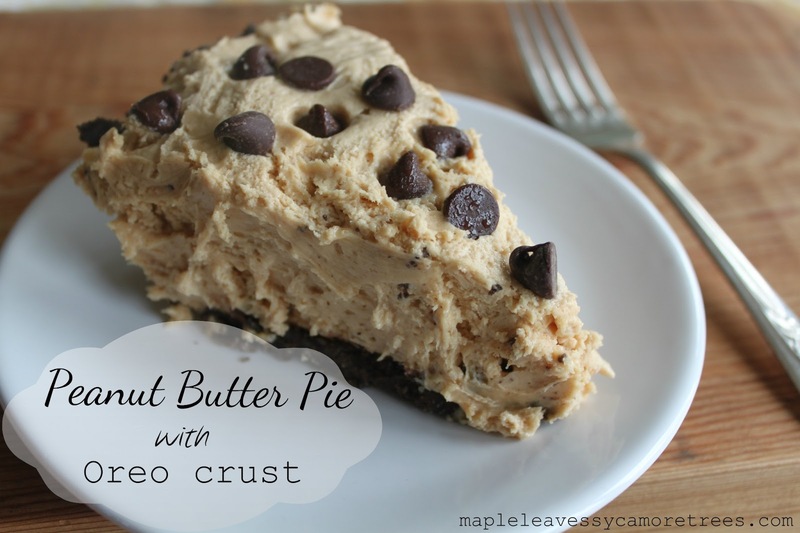 LOVE their pb pie and I LOVE my food processor... all the cooking you do you need one! I don't have a food processor, I wish I did but I just don't have the space. My blender will take care of most of it. Anyway that PB pie looks so good! Funny you equate it with having a baby because that is usually my go to dessert for friends that have just had a baby!